The collaborative app that puts an end to bad network coverage in your area. We want daily situations such as: “I can't hear you properly”, “I barely have coverage”, “that video won't load”…, or the screen showing “only emergency calls”... soon these situations will be things of the past. What started as a dream has become a social movement, thanks to all of you, each operator will know where there are problems in their network and where we aren’t getting the quality we have contracted. Together we are unstoppable! 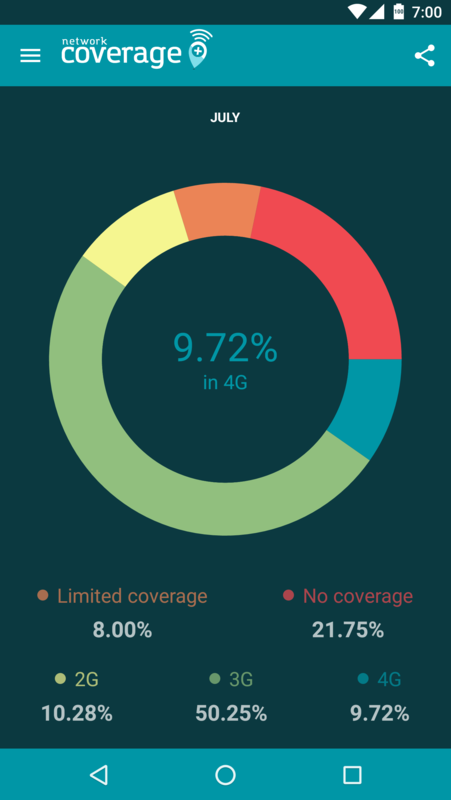 Find out how much time you spend connected to each network type : 2G, 3G, 4G, with limited coverage or without signal. Network coverage+ shows the operators when and where network downtime and mobile internet problems are happening. With Network coverage+ we can collaborate and demand from the operators the quality we are paying for. If you want to share it with us, or contact us, please do. You deserve to be heard. © 2017 Cumberland Solutions S.L. All rights reserved.